Ready for some FEST anthems? Just look at that artwork. If that doesn't get you pumped for some anthemic, high-energy punk rock without even listening to the record, then you're probably not in the target audience for Aussie punks Nerdlinger. This is don't fix it if it ain't broken kind of stuff, even though it is only their debut album. 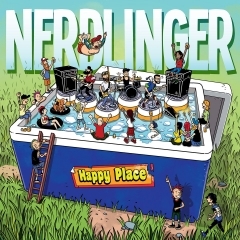 That's the degree of punk rock influence flowing through their veins on "Happy Place", which is an apt title because listening to this record as a fellow punk rocker and closing your eyes results in exactly that scenario: your happy place. Stylistically, the band channel primarily Less Than Jake (only without horns) from circa "GNV FLA"-era and afterward, while mixing in raucous riffs NOFX or Hit The Switch style. So basically, high-energy punk rock Gainesville style with a passionately upbeat tempo and raw, unpolished vibe that just explodes out of the vocals. It's breakneck speed, infectiously catchy, and exactly as simple as it needs to be: resulting in an explosive soundscape that draws you along straight away. The first half is exemplary of how punk rock should be played: no-frills, straight up, super catchy riffs and even catchier choruses to instantly capture its listener. Songs like "Contagious" and "Fat Gav" essentially smash through the gate with melodic energy, infectious vocal lines, and hook-driven guitars. "The Ballad of Rod Lightning" and "Underrated" showcase a little variety in their expression, but it's really not needed because of how energetic their overall soundscape is. 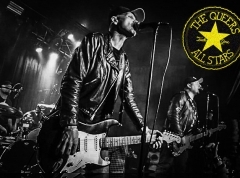 It's pedal-to-the-floor melodies through and through, carrying a melodic charge that brings you back to the golden 90s era of punk rock from the Epitaph and Fat Wreck years. It's irresistible and frighteningly consistent throughout. If the band keep this up on subsequent albums, they might just bring back punk rock into popularity as we remember it from the 90s.